In California’s Death Valley, death is looking just a bit closer. Geologists have determined that the half-mile-wide Ubehebe Crater, formed by a prehistoric volcanic explosion, was created far more recently than previously thought — and that conditions for a sequel may exist today. Up to now, geologists were vague on the age of the 600-foot deep crater, which formed when a rising plume of magma hit a pocket of underground water, creating an explosion. The most common estimate was about 6,000 years, based partly on Native American artifacts found under debris. Now, a team based at Columbia University’s Lamont-Doherty Earth Observatory has used isotopes in rocks blown out of the crater to show that it formed just 800 years ago, around the year 1200. That geologic youth means it probably still has some vigor; moreover, the scientists think there is still enough groundwater and magma around for another eventual reaction. The study appears in the current issue of the journal Geophysical Research Letters. 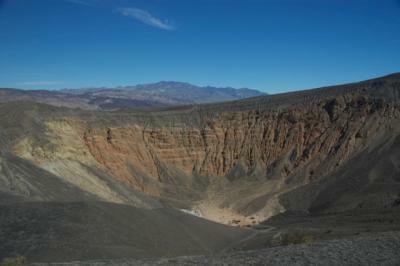 Ubehebe (YOU-bee-HEE-bee) is the largest of a dozen such craters, or maars, clustered over about 3 square kilometers of Death Valley National Park. The violent mixing of magma and water, resulting in a so-called phreatomagmatic explosion, blew a hole in the overlying sedimentary rock, sending out superheated steam, volcanic ash and deadly gases such as sulfur dioxide. Study coauthor Brent Goehring, (now at Purdue University) says this would have created an atom-bomb-like mushroom cloud that collapsed on itself in a donut shape, then rushed outward along the ground at some 200 miles an hour, while rocks hailed down. Any creature within two miles or more would be fatally thrown, suffocated, burned and bombarded, though not necessarily in that order. “It would be fun to witness — but I’d want to be 10 miles away,” said Goehring of the explosion. Hydrological data points the same way. Phreatomagmatic explosions are thought to take place mainly in wet places, which would seem to exclude Death Valley–the hottest, driest place on the continent. Yet, as the researchers point out, Lamont-Doherty tree-ring researchers have already shown that the region was even hotter and drier during Medieval times, when the blowup took place. If there was sufficient water then, there is certainly enough now, they say. Observations of springs and modeling of groundwater levels suggests the modern water table starts about 500 feet below the crater floor. The researchers’ calculations suggest that it would take a spherical magma chamber as small as 300 feet across and an even smaller pocket of water to produce a Ubehebe-size incident.